I have been looking for a simple file management tool for my Treo for quite a while and although FileZ has been one of the most popular solutions to date my own preference is now squarely on a freeware application called FileProg. A file management program in general and Fileprog in particular allow you to easily view and change any of the individual files - including those that are typically 'hidden' from view - on the internal memory of your Treo or to make changes to those files and folders residing on your external SD card. Among others, FileProg's 'actions' include: copy, cut, delete, paste, IR Beam, BT Beam, launch, rename, create directory, format volume and rename volume. Here I found the IR and BT beaming functions particularly useful as you may one day find yourself in need to transfer a file or document to another Treo or PC while on the go (the built-in beam function only allows you to beam applications). For example, as a test I transferred a 3.3MB MP3 file from my Treo 650 to my old Treo 600 via IR and upon completion the file I confirmed the option to transfer to the SD card - very cool. 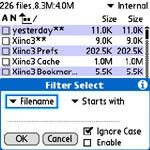 FileProg's 'views' meanwhile include information about: number of files, directory size, free memory, file size, file attributes, sort by name and sort by size. Finally, you can also search for specific files on your SD card and filter views to help you find a file with particular attributes. Since installing it, I have found all kinds of uses for Fileprog and now find myself launching it almost on a daily basis. This is one application that has definitely been added to my 'essentials' collection. That is a good idea. Please post your "essentials" collection. Thanks for pointing me towards this app. I have always used filez but the thing I never liked about it was that it was extremely hard to navigate without a stylus. Fileprog allows me to easily navigate with my fingers (filez was one of the only reasons I ever got out the stylus) and has the benifits you mentioned above. Great app and it is free. Nice find. This program, like others I've seen for the treo, suffers from an overly cluttered screen. I'm sure it has great features, but on a two inch screen i'll be damned if i can figure out how to use them. rememeber the beauty of the original Pilot was a simple, uncluttered interface. I miss that.